What words pop in to your head when you think of Summer? Ice cream and sunglasses? Flip flops and ice lollies? It's brilliant when the sun shines, and there's so much to see and do! Here's a great game for you to play, do you think you can find all of our top Summer words hidden in the wordsearch grid? There's quite a few to find, so good luck! And why not try thinking of some of your favourite Summer words too? 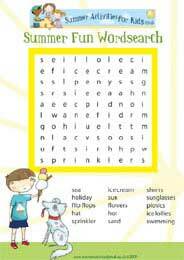 Why not Download the Summer Fun Wordsearch and have fun finding all the hidden words. This activity is aimed at 4 to 8 year olds, it's a fun Summer game for your children to play and can help to build their reading, imagination and problem solving skills.